The Westmatic Rollover system is the ideal washing machine for public or private fleets where brushes will safely and effectively clean many types of vehicles. This 3-Brush Rollover machine thoroughly washes the vehicle using a top horizontal brush, and two vertical side brushes. The brushes will intelligently wash around mirrors and other vehicle protrusions. The Westmatic Rollover is capable of being installed in most existing wash bays. The Westmatic 3-Brush Rollover is available in two options-- the Multiwash and the HEAVY DUTY. The HEAVY DUTY 3-Brush Rollover is the most versatile vehicle wash system on the market today. It washes with brushes, in a touchless mode, or in combination. Each HEAVY DUTY system comes standard with high pressure pumps and a pre-soak arch. The HEAVY DUTY machine is perfect for fleets and municipalities that need to accommodate all types of vehicles. Numerous city departments such as Public Works, Schools, and Public Safety are using the Westmatic HEAVY DUTY to wash their entire fleet of mixed vehicles. The HEAVY DUTY is also perfect for a profitable retail wash facility. 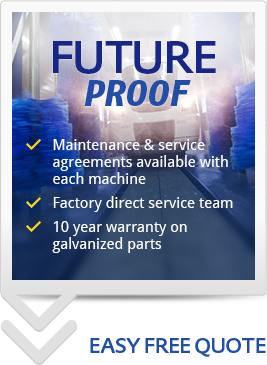 Westmatic's Rollover requires very little maintenance, and can reduce your fleet's cost of operation. Please contact us if you would like to receive more information about our Multiwash Rollover wash system.